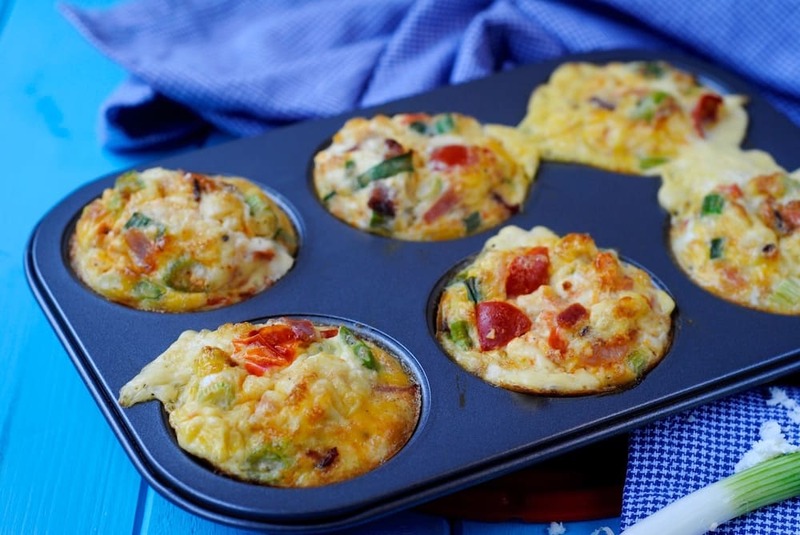 These Breakfast Egg Muffins are the ideal time saving grab and go breakfast for a busy morning. You can make them ahead of time, and with endless flavour combinations, there is something for everyone. A little bacon goes a long way in there and paired with some creamy feta, crunchy onions and some juicy tomatoes, you will want to get out of bed for these. They are a great way to use up vegetables too. Breakfast time can sometimes feel more chaotic than toddlers at an ice cream shop, so we are all for ways to have a healthy, tasty and filling breakfast without much effort at all. If you like eggs for breakfast, but are a bit bored with the usual omelette or poached eggs on toast, then give these Breakfast Egg Muffins a try. 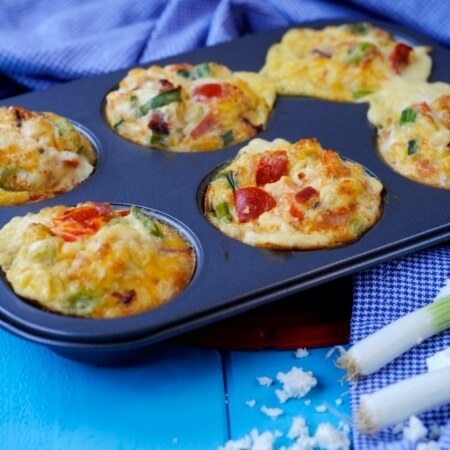 You just chop up any kind of vegetable, cheese or meat, stir it in to whisked eggs and pour in to a greased muffin tin. What could be more simple than that? We are always on the look out for high protein, low carb and veggie packed breakfasts that are hassle free too (tall order, I know) and these definitely tick all the boxes. Our Eggs Baked in Avocado, Breakfast Tray Bake, and Eggs Baked in Tomatoes also fit the bill – so give them a go too. Eggs and bacon is such a classic combination, which is why they really are the star of the show here. You don’t have to go overboard with the bacon – just a couple of rashers cooked, chopped up and stirred in to the mixture goes a long way. Pair it with some creamy feta, fresh tomatoes and crunchy onions and this is a pretty epic flavour combination. Can You Make These in Advance and Freeze? If you are one of those people that thinks they don’t have time for breakfast, then these egg muffins are here to help you out! You can make them ahead of time and then after they have cooled, individually wrap them and keep them in the freezer until you are ready to eat them. They will keep in the freezer for about 2 months. How To Reheat Egg Muffins? Once they are fully defrosted, you can put them in the microwave for about 30 seconds. Be careful not to overcook them, as they can become rubbery and quite tough. How Long Can You Keep Egg Muffins in the Fridge? If you plan on eating them over the few days after cooking them, then keep them in the fridge for ease, rather than freezing them and having to defrost them. They will keep in the fridge for 3-4 days in an air tight container. However, these are so easy to make, you are always best making them from fresh if you can, and making use of leftover vegetables and cheese that need using. Here is where you can get really creative with this recipe, as the flavour combinations are almost endless. We went with bacon, feta, tomatoes and onions, so these were pretty loaded. But you could keep it more simple with just bacon and cheddar. Broccoli or spinach and cheese is a really nice combination, and a good way to get a green vegetable boost first thing in the morning. If you want a real burst of tomato flavour, then use chopped up sun-dried tomatoes instead of cherry tomatoes. Mushrooms as a meaty texture without using meat too. Why stick to just cheddar when there are so many delicious cheeses out there! We always make these in the days between Christmas and New Year when we have had a cheese board and have lots of little bits of different cheeses that need using. Crumble in a mixture of cheddar, stilton and brie. YUM! Any cheese goes really. If I was to just eat these by themselves for breakfast, I would have 2 or 3 for it to be a filling meal. But, if you just want a little protein boosting snack, then one of these is fine as they are pretty big. We love making these when we are feeding a crowd for breakfast, as they can literally be thrown in the oven and forgotten about. So when we batch cook them, we serve them with bagels, our Homemade Best Guacamole Recipe, and coffee of course. Make sure you have really greased your muffin tin before pouring the mixture in, as they can easily stick and you will end up leaving half the muffin in the tin when trying to get them out. Using a good non stick muffin tin helps too. If you don’t want to use oil to grease the muff tin, then you could always use silicone cupcake moulds in the muffin turn and they will easily come out of those. Leave them to cool for about 10 minutes before getting them out of the tin, and run a knife around the muffins to loosen them. These egg muffins do puff up whilst cooking, so you don’t want to pour the mixture all the way to the top of your tin. Just pour to about 3/4 full and they will rise when cooking. You can easily double or triple this recipe if you are feeding a crowd, or just want to make extra to keep in the freezer for easy weekday breakfasts. If you are using spinach, I would recommend cooking it and squeezing out the excess water first. If you add raw spinach to these, the muffin itself might get quite liquidy. Want to make these lower in calories? Apart from swapping the fillings to less cheese and more veggie base, you can use 4 egg whites and 2 whole eggs, rather than 4 whole eggs that we have used in this recipe. One: Chop up your cooked bacon, vegetables and crumble/grate the cheese. Two: Beat the eggs with a little salt and pepper. Three: Add half of your fillings to the greased muffin tin. Four: Divide the egg mixture between the muffin holes. Five: Add the rest of the fillings, making sure the mixture doesn’t go higher than 3/4 of the holes. Six: Put in a preheated oven at 200C for 20 minutes, until the egg is cooked through and risen. Do you want to be kept up to date on more delicious posts like this ? Please subscribe to the blog mailing list (it takes 30 seconds). 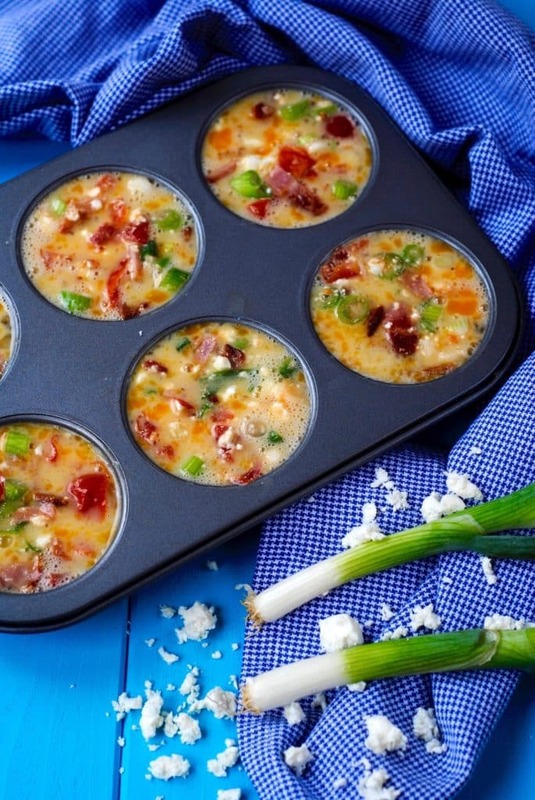 These Feta, Bacon and Tomato Breakfast Egg Muffins are the ideal time saving breakfast. You can make them ahead of time, and with endless flavour combinations, there is something for everyone. Cook the bacon to your liking and then chop into small pieces. Meanwhile, whisk the eggs in a large bowl. Add in the bacon and other ingredients and mix well. Spray a muffin tin a (6 hole one) with oil and pour in the mixture. Put in a preheated oven at 200°C for 20 minutes, until the eggs have risen. I really enjoy reading your recipes. My wife and I have been focusing on many of the things you mention on your site like trying to eliminate the sugar from the diets because of the way it makes you feel an hour or so later. Excellent articles, thank you. I’m sure those muffins are great — I make stuff like that often here — but I just can’t past the adorable-ness of that baby! Very light and healthy. Easy to prepare so that I can make it to my work on time. Thanks Dave.